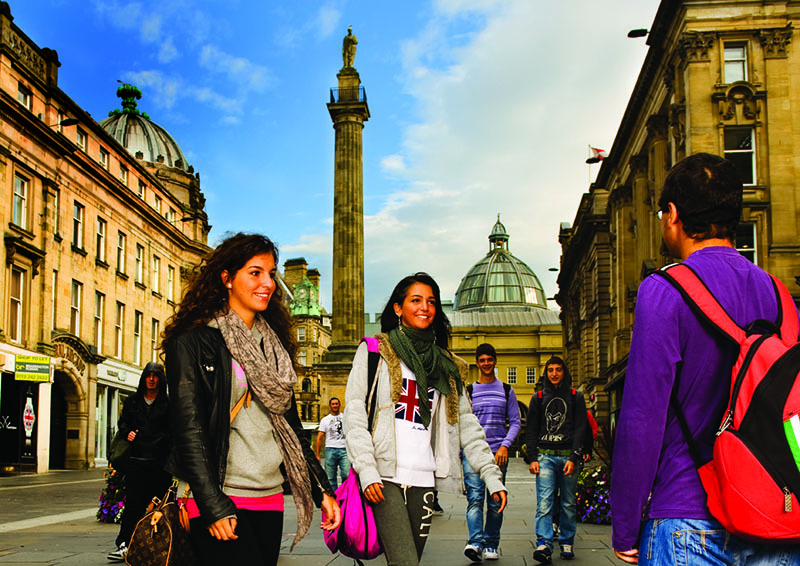 Our partner language school “International House Newcastle” is located in the heart of this lively university town, close to theatres, galleries, museums, restaurants, nightclubs, bars and also parks and gardens which invites you to relax. The school building is considered of special interest and historic beauty and has recently received an award of the British Council. The courses offered by the school and the possible accommodation consist of the highest quality and are also very low priced and convenient. The intensive course includes topics like grammar, reading, writing and pronunciation and is offered for all language levels, from beginner to superior. The teaching method is very communicative with special emphasis on enabling students to communicate effectively in English. Special skills or grammar, for example reading, writing, pronunciation etc. English with reference to personal interests like movies, medicine, law, sports, tourism etc. All students receive a weekly study plan prepared by their teachers, who carefully monitor their progress through continuous test, tutorials and homework. Classes take place from Monday to Friday from 09.00 to 17.00 o’clock. Please note that this schedule depends on the language level and type of course. In July and August there are additional classes in the afternoon between 17:00 and 20:15 o’clock (Intensive 15). The school also organizes classes in this time period during high capacity. Accommodation with host family half board includes a light lunch on weekends. Double rooms at host families are available for students travelling together. Surcharge special diet (e.g. halal, gluten-free, vegan): € 13 on the price of a host family with half board. This price is for an airport transfer upon arrival at Newcastle airport. Please indicate on the booking form the transfer you wish to book. In 2019, the school is closed on: 01/01/2019, 19/04/2019, 22/04/2019, 06/05/2019, 27/05/2019, and from 23/12/2019 until 27/12/2019. Holidays lessons are not made up or rescheduled. In July and August it might be possible that the school organizes evening lessons until 19:00 in periods of high demand. The Business English course includes all the grammar and language skills exercises within the business context. The course of Business English consists of 10 lessons per week hold in a group plus 5 lessons of Business English Personal Study Programme. Topics of the programme are the preparation of meetings, presentations, telephone conversations, negotiations, marketing and finance. The course of 25 lessons also includes an extra 10 extra lessons in general English. The Business English course requires a minimum level of upper intermediate English. Talk about advertising campaigns, branding, consumer behaviour, marketing forecasts etc. Develop vocabulary about production, marketing, public relations, human resources and finance. Present marketing strategies and statistics. Develop listening skills in business contexts. Improve writing skills in formal letters, emails, memos, etc. Improve skills for direct conversation or telephone conversation. The course focus on the TOEIC exam preparation. The TOEIC exam can be taken on the last Friday of each month; other dates can be agreed eventually. Our partner school in Newcastle is an examination centre of the Cambridge exam. Teachers prepare you especially for the written and oral Cambridge examination. The course also includes grammar exercises according to the level of the exam. A wide range of materials, also online materials and practice are included. The course of 15 lessons per week combines 10 lessons in a group with 5 lessons of Academic English Personal Study Programme, in which the student can work on specific issues or practice special skills for the examination. The course of 25 lessons per week includes 10 extra lessons of general English. The Cambridge exam courses might need an extra night or week of accommodation due the exam dates. The extra accommodation is not included in the prices. Please contact for details. Prices of the Cambridge exam courses do not include the exam fee. This course prepares you for the academic English test IELTS. The programme includes 10 lessons per week, hold in group plus 5 lessons of Academic English Personal Study Programme. The course helps students to develop their academic English vocabulary for the IELTS exam. It is also possible to combine the course with 10 extra lessons of general English to receive a total of 25 lessons per week. The course requires an intermediate level of English. It also includes guidance to pass the IELTS test and help with registration for the exam. The one-to-one course ensures maximum attention with the aim of fast learning and understanding. The programme can also be combined with other English classes. This programme is available for students, who would like to gain work experience in a British company in a specific business area. The minimum period of participation is a business English course of 8 weeks followed by an internship of 8 weeks. JobTravel represents a great and unique opportunity for students who wish to improve their English skills while gaining international experience in a company abroad. Students seeking work experience to complete their study of English. Students & Professionals who wish to develop specialized vocabulary. Professionals who want to develop intercultural awareness in their own work field. ﻿﻿The internship can be done in various areas, for example management, marketing, event management, public relations, IT systems, graphic design, music production, engineering, tourism, museums, web development, import / export, translation, sales, finance or retail. During the internship, students are asked to submit a weekly report and also a final report (3-5 pages approx) about their work experience. The company will create a report of your performance as well, one in the middle and the other one in the end of your internship. This course is for teachers and classroom asstistants who teach subjects in English to non-native speakers and who would like to improve the command of English for classroom management and gain new ideas for the teaching context. This course will help you to develop your awareness of current trends in language teaching. To participate in this course you have to have a minimum level of B1. Combining 10 lessons of English language group classes per week with 15 lessons of methodology lessons per week, this Personal Study Programme focuses on individual areas of interest and development. The methodology lessons in small groups will focus on topics such as: motivating languag learners, CLIL, classroom management, analysis of learning styles, presentation of vocabulary and language, phonology, fluency versus accuracy, etc.. The school is easily accessible and only 5 minutes’ walk. The train station is only 7 minutes’ walk and Monument Metro, 8 minutes. The accommodation in a host family is ideal for students who want to share daily life with a local family and practice their English skills in daily situations. You¡ll stay in a single room (or double room if you travel with 2 persons) based on half board (breakfast and dinner during the week, on weekend additional lunch). Most families live in at approx. 25 minutes from school. A host family can be a single person, a couple with or without children etc. These studios are located in the same building as the en-suite rooms in apartments, at only a 6 minute walk to school. You’ll have a private studio with lots of space and home comforts just for you! All studios have: a bedroom with an en-suite bathroom with shower, study area, a fully-fitted kitchen and dining area. In case you wish to share a studio, this is also possible (prices for double use in studio apply), but only for 2 people travelling together, as you will have a double bed.